Just when you think technology needs to be spared from the natural world you hear a story like this. According to the Independent, an Amazon tribe known as the Surui people have joined alliance with none other than tech giant Google to protect their home from loggers. The tribe, who first made contact with the modern world only four decades ago, is replacing bows and arrows for high tech gadgets and cyberspace. The initiative is the brainchild of Chief Almir Narayamoga Surui, who is leading the battle against illegal loggers in their region in Rondonia, in western Brazil. He first discovered Google when he went online and tried out Google Earth. Apparently, much like everyone else he Googled the location of his home, to discover clear signs of logging. The chief took matters into his own hands and set off for San Fransisco to visit the folks at Google to ask the tech giant to help the tribe monitor the loggers incursions. He also hoped that Google would function as a powerful ally in alerting the world to their predicament. "We call Google ragogmakan because we hope it will help us get our message out." said Chief Narayamoga Surui. 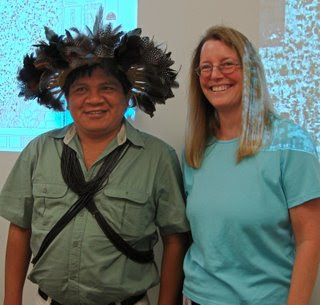 With the help of the US-based Amazon Conservation Team he has been training his people in IT. They use technology not to find their way around the jungle they know so well, but to enable them to record the co-ordinates of any logging they find so that they can report it. And Almir envisages the Surui with solar-powered laptops using Google to download information and to tell the world how their forest is much more valuable if left standing. Amazing, incredible but true. I know there is a movie deal in the works here folks...for now they'll have to make due with a PBS series by filmmaker Denise Zmekhol called "Children of the Amazon." For more information read the Google Earth Newsletter HERE !